Christianity in the early New Testament community was not a peace-of-mind cult which promised freedom from suffering, pain, or tension. The early believers' understanding of a right relationship with God assumed suffering to be a part of that relationship. People will suffer, says 1 Peter, not because they have failed to embrace God revealed in Christ, but precisely because they have embraced him. Christians can expect to suffer because they are Christians. The reasons are manifold. It is people looking inward instead of upward and putting self-will before God's will. Cast off that old nature for those who belong to the fellowship of believers have been born anew and are "chosen and destined by God the Father for obedience to Jesus Christ" (1 Peter 1:2). Obedience to Christ Implies Denial of Self - The self does not die easily and its demise will not be accomplished without a struggle. Every child of the heavenly Father who takes up the gauntlet can expect to suffer as Christ himself suffered when he engaged in the same warfare. Called to Suffer for Righteousness' Sake - Proclaiming and living by a code of ethics which has been forged out of the heart and the will of a loving Father who demands holiness, justice, mercy, and judgment will sometimes put believers out of step with their contemporaries. They will reap the scorn, the contempt, and the rebuke of those who want no one interfering with their selfish purposes and self-centered plans. Yet, it is a kind of suffering for righteousness' sake which the Christian willingly endures for lives hang in the balance. And unless the redeemed do suffer for Christ's sake, lives will be lost. Called to Resist Evil - Believers know that God has fashioned an eternal, irreversible triumph over evil on Calvary's hill, but they also know as well that God's adversary has refused to admit that victory. Evil has not laid down its arms. Evil is real. It is persuasive and it pursues God's children with relentless energy. If members of God's household are to resist its call so as to continue their walk on the narrow road that leads to life, such resistance assumes a dedication that is willing to experience suffering for Christ's sake. Rejoicing Under Strange Circumstances - Not only does 1 Peter underscore the premise that suffering will be a part of the Christian lot, but also presents the startling claim that members of the faith can find reasons to rejoice in their tribulations when they come. Taking a negative and turning it into a positive, the letter projects the thought that where there is a willingness to suffer for the faith, God's kingdom work can go forward and the Lord God be glorified. The Historical Setting - Though it is not certain whether the message of 1 Peter was aimed at a congregation actively being persecuted or whether it was meant to be read by a church which expected a wave of persecution in the near future, one thing is certain, it is a letter of encouragement and reassurance designed to fan the flame of hope in the believer's hearts, which would not flicker and die even in the darkest moments of the church's life. Live with honor in the present, victory in the future, hold fast to the memory of what God has done in the past, and remember the cross and the empty tomb. Not One World, but Two! - Christians are born anew to a living hope for they see themselves as the citizens of two kingdoms. Released from the crippling notion that life ends at the foot of a tombstone, the redeemed of God, who hold fast to the faith, catch a glimpse of what lies beyond. They find courage and strength to tolerate the present and whatever burdens it might bring. They lean upon God and beseech him for the power to be what he wants them to be, they deny themselves, take up their crosses and suffer as they surely must for righteousness' sake, that others of God's creatures might become God's children and thus share with them a place in eternity. Discarded dark garment - Put off the old nature. Figure wears light garment - "You have been born anew." Figure walks on narrow road cluttered with obstacles - The road is narrow that leads to life. Dark Forest - Evil is real. It will exert its pressures upon you. Burning log - "Do not be surprised at the fiery ordeal which comes upon you." You are called to suffer for righteousness' sake. 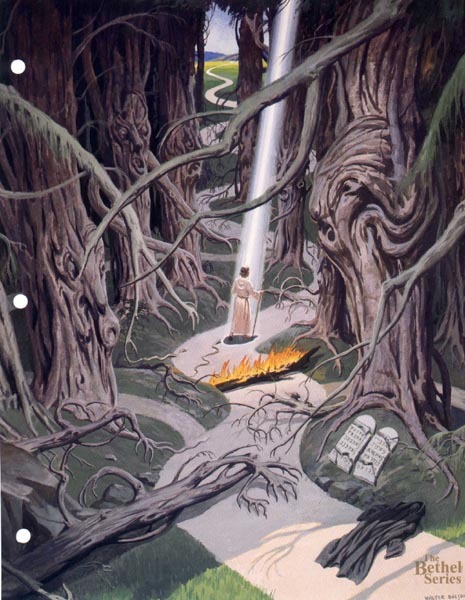 Path leading off narrow road to broken law tablets - Temptations will come urging you to depart from the anrrow way. Resist them. Shaft of light - You do not walk alone. God walks with you. Road leads to light - Endure, and you will obtain the unfading crown of glory.